If you're a fan of the Persona series, then you probably love the games' characters. All the characters have great stories and well-rounded personalities that make them relatable and they're a huge part of the reason why I've spent hundreds of hours playing through the series so far. But there's a group of characters that often get overlooked next to the main cast, yet the main cast need them to survive in all the dungeons that need to be crawled. I'm talking about where the series gets its name, the Personas - the monsters who fight for the characters. Konohana Sakuya is Yukiko's elegant Persona that boasts gorgeous looking fans and uses fire attacks. Yukiko's my best girl when playing Persona 4 Arena Ultimax, so I was really excited to find a figure of her and the Bandai version of her Persona in Akihabara. Recently though, I found a bigger version of Konohana Sakuya in the form of the DX version of this figure pre-owned for a reasonable price. When I started my figure collection, I said to myself I wouldn't be the person to have multiple figures of the same character, but it happened because both figures are so stunning. Because of this, I thought I'd do a figure face-off style review to decide which figure should take up more shelf space and to help those who are trying to decide between the two. Looking between the figures and a photo of Konohana Sakuya, you can see that both figures are accurate in colour to the original character photo. 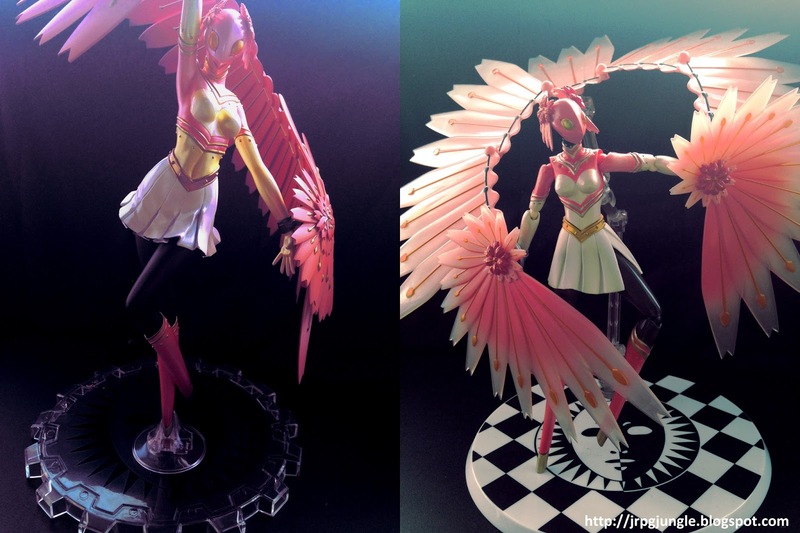 Both figure's colours feature the vibrant rose pink colour of the Persona, but I would say that the Bandai figure is richer in colour than the DX figure whereas the DX figure is just a little lighter than the photo (on my monitor anyway). It's interesting to see that both figures opted for a different gold accent tone, with the DX figure using a green-based gold colour and the Bandai figure opting for a yellow-based gold. While the vibrant gold is very eye catching, looking at a photo of Konohana Sakuya, the green gold is more in line with the actual colour of Konohana Sakuya's gold accents. On the subject of the gold colours, both figures opted to change the colour of the figure's eyes to a different gold shade. I don't understand why, as looking at Konohana Sakuya in photos and the game, I really don't think her eyes are a different colour to the rest of the gold on her. I almost wish I could swap the Bandai and DX eyes so the eyes were consistent to the rest of the figure, but this is a very minor complaint, so I'll survive. Winner: Bandai - While the DX figure is more colour accurate to Konohana Sakuya, I do enjoy the richness and vibrancy of colour of the Bandai figure. The brightness adds to the figure's majestic look and the vibrant ombre effect on the Persona's fans looks stunning when posed well. Looking at reviews online, both of these figures have some issues with durability. However in my own experience, there's a clear winner for this round since the only figure I've had problems with is the Bandai figure. Because of the Bandai figures ability to be posed, lots of parts can be moved into cool poses, which is great. However, this feature of the figure would be much cooler if pieces didn't fall off so easily in the process. Setting up Bandai Konohana Sakuya's fans has a tendency to feel like setting up dominoes - one wrong move and you may have to set up half the pose again because either one of the hands or one or more of the other fans came off. I've also had legs and the actual discs that hold the fans come off. My figure has never broken permanently, but I find a touch it very gingerly because I'm worried about damaging one of the joints. Also worth noting - there is a small bit of damage on one of the discs that attaches the fans. It's thankfully covered up by the fans and the damage was there when I bought the figure pre-owned, but it does add to my fear of damaging the figure. Winner: DX - Meanwhile, the DX figure is not poseable and therefore doesn't have this problem. The two joints attaching the fan are solid and even as a pre-owned figure, there are no signs of wear and tear on my figure. I have read online (specifically at myfigurecollection.net) that some people have had issues with the DX figure's fans breaking during transit or by accident, so I'd maybe recommend keeping it in safe area (but I would recommend this with most figures anyway). Since my figure is in perfect condition and I haven't had an fear of breaking it so far, DX Konohana Sakuya easily wins this round. Between a figure that is poseable and a figure that isn't, one could think there is no argument in this category. Although this is mostly true, I wanted to talk about the pros and cons of each of the figure's poses and poseability. What I like about the DX figure that is the pose it's in is the pose I originally wanted when I was searching Konohana Sakuya images when trying to re-pose my Bandai figure. The DX figure's pose was my favourite pose I saw, but I hadn't realised these were two different figures yet. Because the DX figure is built specifically for it's pose, every single angle looks perfect and I don't really mind not being able to change her. 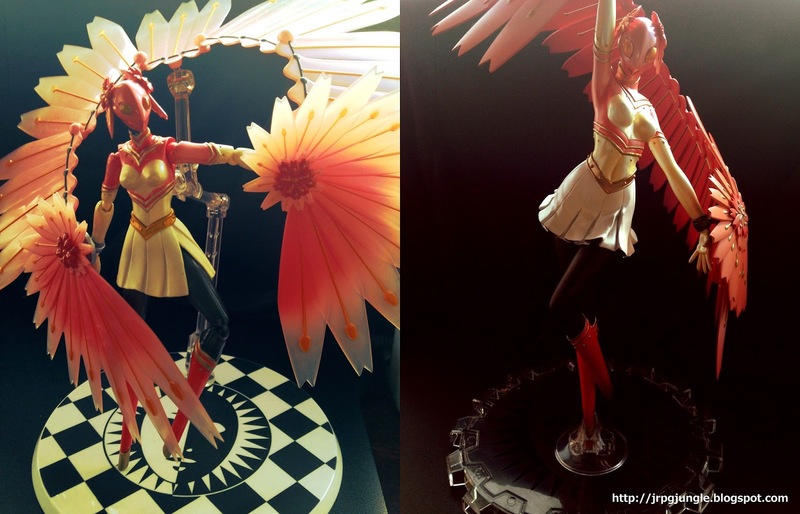 The Bandai figure can be posed in many different poses and can look great if you're patient about the process. It's pretty fun to pose after you get over fear of breaking the figure. When I look on Google Images at some of the images of other people's figures, there are some magnificent looking poses that can be achieved with this figure. Looking at those images and my own, I can confidently say that the Bandai figure can really be a standout in a figure collection when put in the right pose. The only compliant I have about this poseability is the way the fans look. Although they're beautiful, because they can be moved around, they can sometimes look more like connected fan or spike clusters rather than one big fan. Winner: Bandai - Even though I do like the overall appearance of the fans on the DX figure better because of the smooth look, having a poseable figure is a huge advantage, so Bandai has to win this round. Although I'm not personally able to get the fans looking smooth and how I want them, some people have done a great job in making the figure look incredible and it really does look incredible if you spend them time making it look it's best. Both figures boast cool stands featuring the Persona symbol, the DX one being clear and the Bandai one being black and white and fully opaque with some extra details. 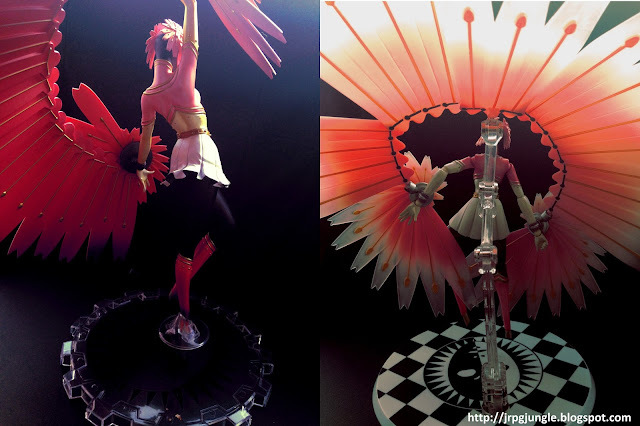 The actual figures themselves are held on their stands in different ways, with the Bandai figure's stand attaching on the back of the torso and the DX one's feet being molded to the stand. Both stands certainly fulfill their purpose of holding the figures up and displaying them well, but there are some significant differences from various angles due to the difference in stand types. The Bandai stand, like the rest of the figure, is adjustable, which means she can be posed to be slightly elevated and to look like she's flying, which is pretty freaking awesome. The poseable joints on the stand are a little more steady than the body of the figure and hold most poses really well, although can still be a hassle while posing because they look to come off the figure while you adjust it. Because the stand attaches on the back of Konohana Sakuya, the stand is visable when looked at on a 360 degree angle. This isn't a problem, although if you considering displaying her in a spinning case, it's worth noting that the stand will be visible. On the other hand, the DX figure uses a unique way of holding up Konohana Sakuya - her feet are molded to the base. This initially freaked me out when I opened the box - I was so scared of her feet breaking off from the base and ruining the figure. However, it seems to be sturdy as I haven't had that problem, even after attaching the fans to her hands. The base of the stand is thick and I like how the clear design doesn't take away attention from the figure - no stand gets in the way of admiring this figure from all angles. An added bonus to the gear-like design of this stand is that it can also slot the DX Izanagi figure to it or it can look cool without. Options are always a plus. Winner: DX - While the stands of these figures were definitely not deciding factors when I made my purchase, I like the DX stand best because of how the figure can be looked at from every angle, but both are good stands. This will truly come down to personal preference - if you want to make it look like your figure is flying, I recommend the Bandai figure. If you want to put your figure in one of those spinning display boxes or don't like setting stands up, I recommend the DX figure. Both figures are what I would call high quality - both are painted well, are detailed and look really accurate when looking at photos of the character in the game and the anime. These figures are both however made from different materials and handle certain details of Konohana Sakuya a little differently. The DX figure is very hard to fault for quality. The figure has plenty of attention to detail, from the size scaling, to the fans, to the muscle definition on her torso. The DX figure is made from PVC, which is a fairly strong material, although as mentioned earlier, has sadly snapped for some people on the attachable fans. I would say between the two figures, the DX figure is the most accurate when comparing to Konohana Sakuya - other than the orange gold eyes, I can't notice any differences between the figure and character photos. The Bandai figure is made from a mix of ABS and PVC. Most of the body feels like it's made from ABS, which is good because ABS is a very strong material and therefore there isn't much need to fear permanent damage. However, I've mentioned many times in this article my problem with pieces coming off while attaching them, which isn't permanent damage but does making posing it a real pain - I find myself trying to get it in the most practical pose that still looks cool and leaving it for as long as possible. 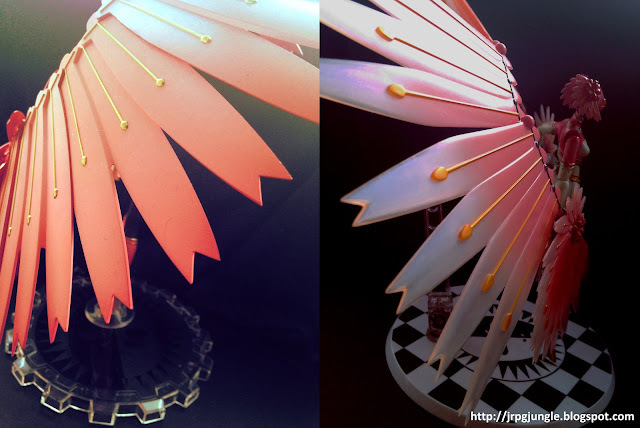 The figures details are very beautiful, with the ombre fans looking incredible. On the fan closest to Sakuya's hand though, the Bandai figure looks a little different to the character photo and design of Konohana Sakuya, changing the flower to look darker and rounder, presumably to provide a contrast in colour because of how small it is compared to the rest of the fan. Winner: DX - It's a tough decision, as I truly am impressed with the quality of both of these figures and both are made from strong materials. I have to go with the DX figure here though, because I've had no problems with it and that speaks most to me when I think about quality. The Bandai figure is made from stronger materials, but the quality of it's attachable pieces make the figure feel secondary next to the DX. I love both figures so much and my Bandai probably won't be leaving my shelf anytime soon, but I can't deny the superior quality and easily displayable DX Konohana Sakuya. 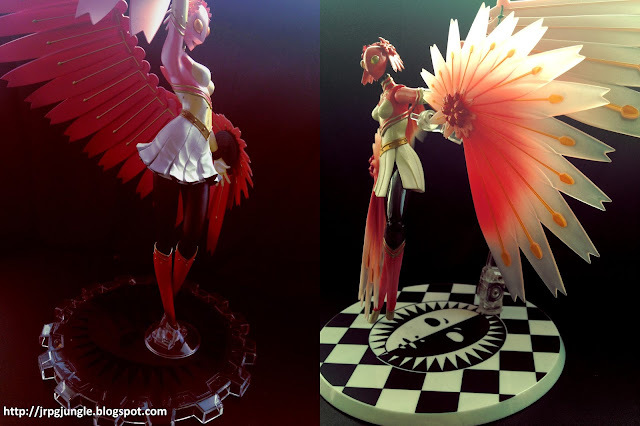 The figure is bigger, less time consuming and looks beautiful from every angle. If you are looking for versatility in a figure, the Bandai figure can be posed to look amazing for those more patient than me. But for a high quality, tall figure to display somewhere prominent, I would definitely recommend DX's Konohana Sakuya figure. The DX and Bandai Konohana Sakuya figures are available from Crunchyroll brand new. I did manage to get mine pre-owned for a much cheaper price within Japan, so make sure to shop around and get the best deal you can. Pre-owned versions can of course be found many places online, but always make sure you are buying for a reputable seller! Will you be picking up one of these figures? 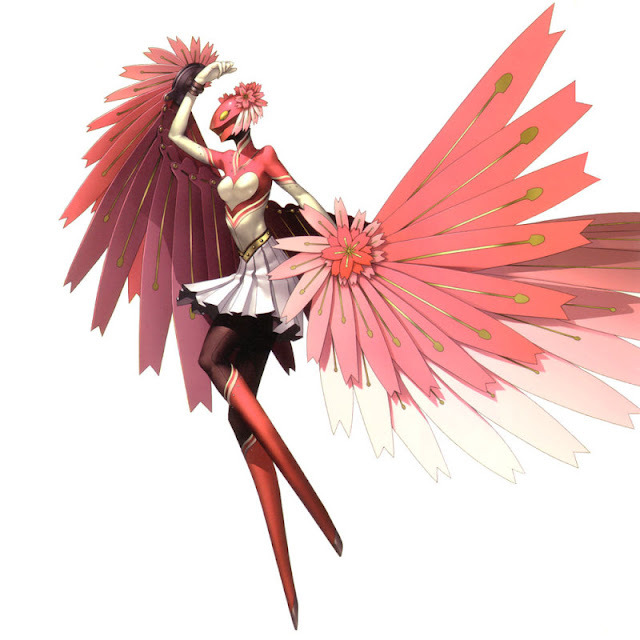 What Persona do you want to see as a figure? I love hearing your thoughts (and seeing pics of your figures! ), so please comment below or send a tweet to @JRPGJungle and follow to keep up our content. :) Thanks for stopping by!